Opening Celebration: 4-6 PM on December 22, 2018, at the base of the Jackson Hole Mountain Resort. Glow Nights takes place in Teton Village, Wyoming at the base of the world famous Jackson Hole Mountain Resort from December 22nd through February 2019. Glow Nights launches with a festive après-ski celebration of art, projections, and music on December 22nd from 4:00 pm – 6:00 pm. Inspired by the unique phenomena of the Greater Yellowstone Ecosystem, artists have created illuminated works for display in the Teton Village Commons that are inspired by the calderas, geysers, peaks, forests, and the phosphorescent microbes of the Greater Yellowstone Ecosystem (GYE). Participating artists include Claudia Bueno, a Venezuelan light and shadow artist who has shown her work in Europe, Asia, Latin America, and the United States. Claudia was recently commissioned to created work for Meow Wolf, Las Vegas. Claudia’s illuminated tree is filled with fiber optics and LED’s to create a canopy of wonder. Raised in Jackson Hole, Bland Hoke is a public artist specializing in collaborative design. Bland’s work can be found from Raleigh North Carolina to Ashland, Oregon. Hoke has received a Fast Company, Innovation By Design Award for his Soft-Walks and his installation titled the Beacon transformed the Village Commons last winter and inspired us to commission multiple installations this year. Bland will use LED’s, snow, and ice to mesmerize passers-by. Innovative architecture firm Carney Logan Burke Architects is inspired by the power of landscape, the quality of light, and the simple honesty of vernacular architecture. Their installation, Face Time, invites us to stop and listen to each other and the world around us. Walt Gerald is a multidisciplinary artist that draws heavily on inspiration from both the natural and supernatural world. His work uses digital media, sculpture, and printmaking to communicate ideas of myth and folklore, pertaining especially to the Greater Yellowstone Ecosystem and its history. Walt’s artwork has been featured nation-wide, most recently at the Denver ComicCon in Colorado and the Desert Daze Music Festival in California. 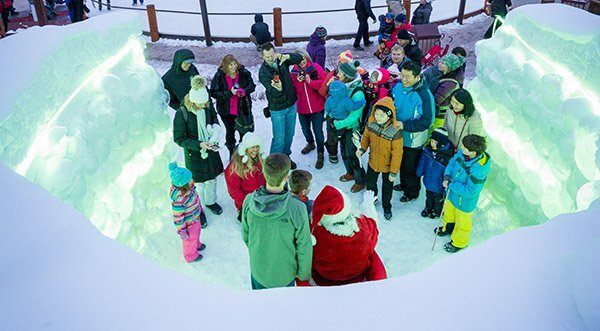 GLOW Nights is sponsored by the Jackson Hole Mountain Resort and Teton Village Association with additional funding provided by the Wyoming Cultural Trust Fund, First Western Trust, and the friends of Jackson Hole Public Art. GLOW Nights is produced by Jackson Hole Public Art. Teton Village Association Improvement & Service District is a local government entity supported by the Teton Village businesses that provides municipal type services in the commercial areas of the Village. Teton Village Association ISD enhances the guest experience to make Teton Village the #1 destination resort community. Teton Village supports the year-round economic, environmental, social and fiscal health of the Jackson Hole community.